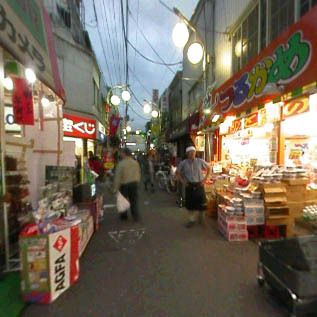 View a virtual reality of this neighborhood shopping street and listen to its sounds by clicking on Audio-Visual. This is a 2.5 mg download. Japan has a long tradition of neighborhood shopping streets (shōtengai) where people shop for daily necessities at many small, specialized shops where shopkeepers call out the friendly greeting “irrasshaimase!” to attract customers. These neighborhood shops now face competition from two newer kinds of stores: supermarkets and convenience stores. Small neighborhood supermarkets offer a wider range of goods, including many kinds of pre-packaged prepared foods. Some even try to retain the atmosphere of the old fish and vegetable shops with recordings that shout “irrasshaimase!’ as customers enter a section of the store. Convenience stores can also now be found on neighborhood shopping streets. They stay open late, or even all night. Convenience stores sell an array of snacks, cold drinks, magazines, and miscellaneous items. They also offer customers a convenient place to pay their utility bills. The number of convenience stores in Japan has grown rapidly from 23,837 stores in 1991 to 39,628 stores in 1999, during which time sales have nearly doubled. They employ half a million people. Nearly two-thirds of these convenience stores are open 24 hours a day.